Plumage: Feathers are white with black wingtips and tails. A grey streak runs down their neck. Habitat: The species can be found near the aquatic regions of Australia, including coasts, wetlands, swamps, lakes and rivers. Pelicans will also journey inland during years when the giant saltpan, Lake Eyre, floods due to excessive rains outside the region. Geography: Though most live in Australia, the pelicans can also be found in Papua New Guinea, New Zealand, as well as parts of Indonesia. It is the only pelican located in Australia. Diet: Pelicans main source of food is fish although they have been known to eat crustaceans, shrimps, small turtles, frogs, and, in rare cases, other birds. A mature Australian pelican consumes an average of 4 pounds (1.8 kilograms) daily. Breeding: Australian pelicans breed perennially. When they breed is largely determined by environmental conditions, particularly rainfall. Pelicans prefer to breed in large colonies, some of which are as large as 40,000 individuals. During courtship, to attract potential mates, pelicans will clap their bills open and shut to create a rippling effect on their pouch. Their bills and pouches also change color during mating, showing off blue, pink, black and yellow displays. Males swing their open bills side-to-side both to attract females and to ward off other suitors. Threats: Although a low-risk species, habitat destruction, oil spills, pesticide poisonings are all threats to pelican populations. The word pelican stems from pelekas (woodpecker) and from pelekys (ax) – both referencing the pelican’s long bill. Australian pelicans have the largest bill in avian world. Despite their large size, Australian pelicans are so buoyant they cannot sink under water. Their pouch can hold a little over 3 gallons (11 liters) of water. That is 2 to 3 times the amount they can hold in their stomachs. Contrary to popular belief, pelicans do not use their pouch for long-term storage. It is rather used as a kind of net and short-term collector for food and water. Australian pelicans feed mostly in groups, cooperating to herd fish into a single location before they dive for their prey. A group of pelicans is called a pod. Though Australian pelicans cannot sustain long periods of wing-flapping flight, they can remain airborne for almost twenty-four hours by riding on thermals. Their ability to fly is due, in part, to their very light skeleton, which accounts for only 10% of their total body weight. Pelican chicks communicate with their parents while still in the egg. They often signal to the parent whether they are too hot or too cold. 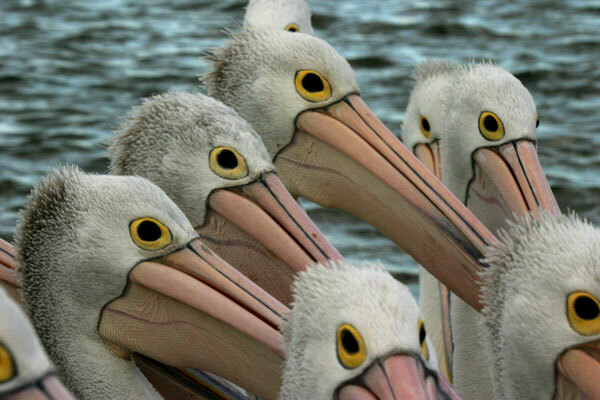 After raising one brood, Lake Eyre pelicans will raise another brood if there is enough water still in the region.